NEMCA Crit Skills and Mt. Blue Crit – Team Monster Truck p/b Hub Bicycle Co. Note from Valerie: This post was supposed to go up months ago. This is what happens when I don’t log into our WordPress regularly enough. All of my apologies to Allison for not being a good team blog moderator. 😦 Now with pictures! On a cold slainy (raowny? rain-snow? snow-rain?) day at the end of March Valerie, Grant, and I gathered in Rhode Island to learn some skills at the NEMCA Criterium Skills and Safety Clinic. We spent a few hours inside talking shop, discussing nutrition, smarter racing, the equipment choice, and pace lines, among other things. We then ventured outside to put our new skills to the test. The original plan was to ride to Ninigret to practice, but, due to weather, we rode to a quiet loop nearby. We were able to practice riding closely and bridging to the next group up the road, before the weather sent us back. Skills sharpened, it was time to race. 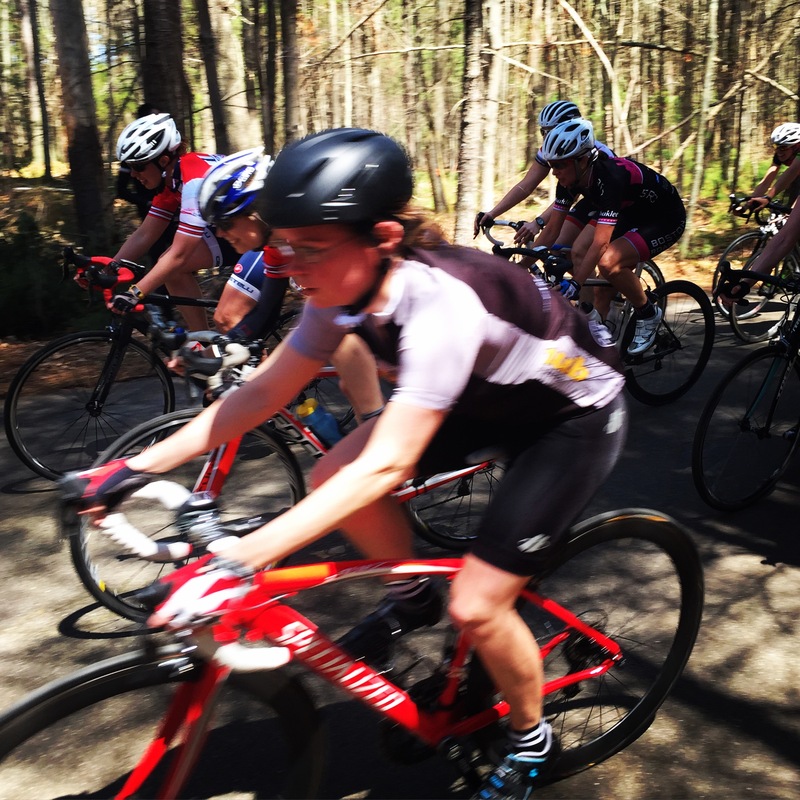 The first race I tried was the women’s 3/4 race at Mt. 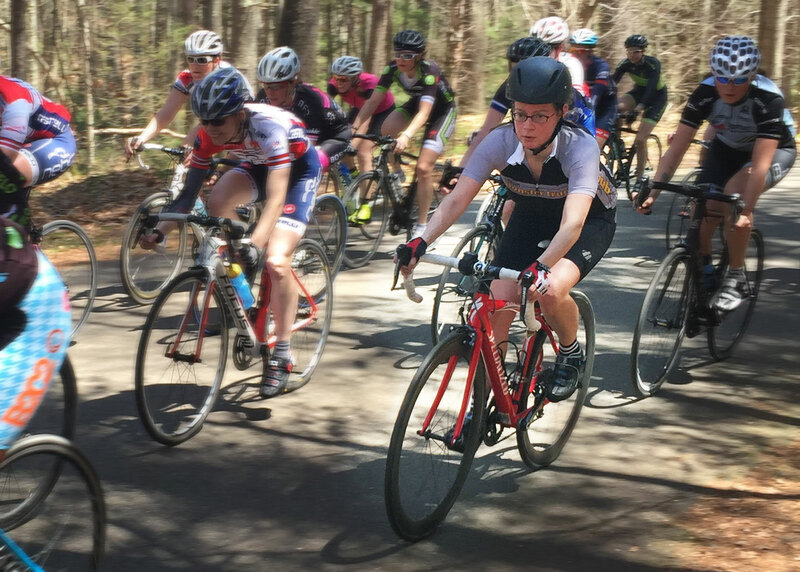 Blue Criterium in Wompatuck State Park. The course is a soft 1.3 mile oval, with no real corners or elevations change, prefect for an early season race. Our first lap, a soft start as everyone settled in. Coming around the finish for the second lap there was an acceleration at the front, and the group strung out and gaps opened. I struggled to hang on. We ended up in two pacelines zooming through the next few laps. Luckily the pace eased down again and I was able to move my way up the pack. My legs feeling good, I had hopes for a good finish. I was also having a completely different race experience near the front of the pack. The pace was more consistent and I could see attacks happening. It was an entirely different reality than dangling off the back. Allison MonsterTrucking through the field. Photo by Grant Halsey. With three to go, a movement to my right, and suddenly the rider to my right was on the ground in front of my wheel. I wish I could say I employed some fantastic save, but I ended up on the pavement in a lot of pain minus a lot of skin. I had a brief thought that I should get up and finish, but I was in too much pain, and with that my first race of the season came to a close. Previous Previous post: Stay weird. Pingback: Never give up, never surrender | Team Monster Truck p/b Hub Bicycle Co.